What are "normal" cholesterol blood levels? What are HDL cholesterol (good) vs. LDL cholesterol (bad)? What do they do? What are LDL/HDL and total/HDL ranges and ratios? How can levels of HDL cholesterol be increased? How can high LDL or "bad" cholesterol levels be lowered? What medications lower cholesterol, lipids, and triglycerides? Is lowering LDL cholesterol enough? What are triglycerides and VLDL? A high blood cholesterol levels is also referred to as hypercholesterolemia, and is found in the blood circulation of humans. Cholesterol is a fatty substance that is an important part of the outer lining of cells in the body of animals. Because cholesterol is a fat (medically referred to as lipid), elevated blood cholesterol is sometimes referred to as hyperlipidemia. Cholesterol in the blood originates from dietary intake and liver production. Dietary cholesterol comes primarily from animal sources including meat, poultry, fish, and dairy products. Organ meats such as liver are especially high in cholesterol. LDL (low density lipoprotein) cholesterol is called "bad" cholesterol because elevated levels of LDL cholesterol are associated with an increased risk of stroke, peripheral artery disease, or coronary heart disease (atherosclerotic cardiovascular disease, ASCVD). HDL (high density lipoprotein) cholesterol is called the "good" cholesterol because HDL cholesterol particles prevent atherosclerosis by extracting cholesterol from artery walls and disposing of them through liver metabolism. High levels of LDL cholesterol and low levels of HDL cholesterol are risk factors for narrowing of the arteries in the body (atherosclerosis). Research has shown that lowering LDL cholesterol reduces the risk of heart attacks, strokes, and peripheral artery disease. The National Institute of Health, the American Heart Association, and the American College of Cardiology publish guidelines to help physicians and patients with this risk reduction for heart attack, stroke, and peripheral artery disease. Factors that affect blood cholesterol levels include diet, body weight, exercise, age and gender, diabetes, heredity, and underlying medical conditions. Guidelines recommend that cholesterol screening occur every 5 years after age 20. Should elevated cholesterol levels be found, testing may need to occur more frequently. People with cardiovascular disease, type 2 diabetes, LDL cholesterol levels greater 190 mg/dL, and those with a 10-year heart disease risk of greater than 7.5% would benefit from moderate- to high-intensity statin drug therapy. Cholesterol-lowering statin medications decrease the risk of heart disease. Cholesterol is a chemical compound that is naturally produced by the body and is structurally a combination of fat (lipid) and steroid. Cholesterol is a building block for cell membranes and for hormones, for example, estrogen and testosterone. The liver produces about 80% of the body's cholesterol, while the rest comes from our diet. The main sources of dietary cholesterol are meat, poultry, fish, and dairy products. Organ meats, such as liver, are especially high in cholesterol content, while foods of plant origin contain no cholesterol. After a meal, dietary cholesterol is absorbed from the intestine and stored in the liver. The liver is able to regulate cholesterol levels in the bloodstream and can secrete cholesterol if the body needs it. LDL and HDL are the two main types of cholesterol (blood fats, or lipids) that make up your total cholesterol. There is a third type of cholesterol called VLDL (very-low-density lipoproteins), which is another type of “bad” cholesterol produced in the liver, and contains a high amount of triglycerides. There are no established "normal" blood levels for total and LDL cholesterol. In most other blood tests in medicine, normal ranges can be set by taking measurements from large number of healthy subjects. The normal range of LDL cholesterol among "healthy" adults (adults with no known coronary heart disease) in the United States may be too high. The atherosclerosis process may be quietly progressing in many healthy children and adults with average LDL cholesterol blood levels, putting them at risk of developing coronary heart disease in the future. What is LDL cholesterol or the "bad" cholesterol? LDL cholesterol (low-density lipoprotein) is called "bad" cholesterol, because elevated levels of LDL cholesterol are associated with an increased risk of coronary heart disease, stroke, and peripheral artery disease. LDL lipoprotein deposits cholesterol along the inside of artery walls, causing the formation of a hard, thick substance called cholesterol plaque. Over time, cholesterol plaque causes thickening of the artery walls and narrowing of the lumen of the arteries, a process called atherosclerosis, which decreases blood flow through the narrowed plaque-filled vessel. Narrowing of blood vessels in the heart may lead to angina (a type of chest pain) or heart attack. Narrowing of blood vessels in the brain this may cause a transient ischemic attack (TIA) or stroke. Narrowing of the arteries throughout the body (peripheral artery disease) can lead to signs and symptoms of pain, including in the intestine (mesenteric ischemia) and in the legs with walking (claudication). What is HDL cholesterol or the "good" cholesterol? HDL cholesterol (high-density lipoprotein) is called the "good cholesterol" because HDL cholesterol particles prevent atherosclerosis by extracting cholesterol from the artery walls and disposing of them through the liver. Low levels of LDL cholesterol and high levels of HDL cholesterol (low LDL/HDL ratios) are desirable and protect against heart disease and stroke. Like LDL cholesterol, lifestyle factors, and other conditions influence HDL cholesterol levels. HDL cholesterol levels tend to be lower in persons who smoke cigarettes or have type 2 diabetes and in those who are overweight or inactive. HDL cholesterol is higher in people who are lean, exercise regularly, and do not smoke cigarettes. Estrogen increases a person's HDL cholesterol, which explains why women generally have higher HDL levels than men do. The combination of low levels of total and LDL cholesterol and high levels of HDL cholesterol is favorable. What does "total" cholesterol mean? Total cholesterol is the sum of LDL (low-density) cholesterol, HDL (high -ensity) cholesterol, VLDL (very low-density) cholesterol, and IDL (intermediate density) cholesterol. What determines the level of LDL or "bad" cholesterol in the blood? The liver manufactures and secretes LDL cholesterol into the blood. It also removes LDL cholesterol from the blood by active LDL receptors on the surface of its cells. A decrease in the number of liver cell LDL receptors is associated with high LDL cholesterol blood levels. Both heredity and diet have a significant influence on a person's LDL, HDL, and total cholesterol levels. For example, familial hypercholesterolemia (an inherited form of very high cholesterol in the blood) is a disorder in which patients have a diminished number or nonexistent LDL receptors on the surface of liver cells. People with this disorder also tend to develop atherosclerosis and heart attacks during early adulthood. Diets that are high in saturated fats and cholesterol raise the levels of LDL cholesterol in the blood. Fats are classified as saturated or unsaturated (according to their chemical structure). Saturated fats are derived primarily from meat and dairy products and can raise blood cholesterol levels. Some vegetable oils made from coconut, palm, and cocoa are high in saturated fats. The American College of Cardiology and American Heart Association have guidelines to help health-care professionals counsel patients on how to decrease the risk of suffering a heart attack or stroke. Since it takes years for cholesterol plaque to narrow arteries enough to cause blood flow problems, there is opportunity to intervene early to stop the progression of this narrowing. The goal for statin therapy is to decrease the LDL blood levels. In patients' prescribed high intensity statin therapy, the goal is to lower LDL levels by 50%. For those who have medium intensity statin therapy, the goal is a LDL reduction of 30% to 50%. The total cholesterol to HDL cholesterol ratio (total chol/HDL) is a number helpful in estimating the risk of developing atherosclerosis. The number is obtained by dividing total cholesterol by HDL cholesterol. (High ratios indicate a higher risk of heart attacks, whereas low ratios indicate a lower risk). High total cholesterol and low HDL cholesterol increases the ratio and is undesirable. Conversely, high HDL cholesterol and low total cholesterol lowers the ratio and is desirable. Ideally, one should strive for ratios of 2 or 3 (less than 4). The first step in increasing HDL cholesterol levels (and decreasing LDL/HDL ratios) is by implementing and maintaining therapeutic life style changes. Regular aerobic exercise, loss of excess weight (fat), and smoking cessation will increase HDL cholesterol levels. Regular alcohol consumption in moderation (such as one drink a day) will also raise HDL cholesterol. Because of other adverse health consequences of excessive alcohol consumption, alcohol is not recommended as a standard treatment for low HDL cholesterol. Medications to lower cholesterol: Medications are prescribed when lifestyle changes cannot reduce the LDL cholesterol to desired levels. The most effective and widely used medications to lower LDL cholesterol are called statins. Research has shown that only these statin drugs have a proven benefit to decrease the risk of heart attack and stroke. Other medications prescribed to lower cholesterol profiles include fibrates such as gemfibrozil (Lopid), resins such as cholestyramine (Questran), and ezetimibe (Zetia). Newer medications, PCSK9 protein antibodies, Alirocumab (Praluent) and evolocumab (Repatha) are potentially useful in treating certain patients where diet and statins have failed to adequately lower LDL level. A healthy diet that minimizes cholesterol intake is a good first step in using food to decrease cholesterol levels in the blood. Extra lean meats, skim milk, and vegetable-based "butter-like" substitutes may help decrease LDL levels in the bloodstream. In addition to diet, exercise, and weight loss, there are foods that may help in lowering and rebalancing the cholesterol -- increasing HDL (the good) and decreasing LDL (the bad). The goal for consumption of dietary fiber is 5 to 10 grams of soluble fiber a day (a cup of oatmeal has 4 grams of fiber and an apple contains 3 grams). Olive oil acts as an antioxidant to decrease LDL levels and does not affect levels of good HDL cholesterol. Foods fortified with plant sterols and stanols decrease cholesterol absorption in the intestine. They can be found in cereal, margarines, and yogurts. Read labels to discover which foods are fortified with these beneficial plant compounds. Sterols and stanols may also be found as a dietary supplement. Soy and foods containing soy products may help decrease LDL levels. However, nuts are high in calories and should be eaten in moderation. Avoid nuts covered with salt or sugar. Certain fish contain omega-3 fatty acids that lower cholesterol levels. The American Heart Association recommends at least 2 to 3 servings per week in the diet. Fatty fish that are helpful include salmon, halibut, mackerel, trout, herring, and sardines. It's best to grill or bake fish and to avoid frying. Lipid-altering medications are used to lower blood levels of undesirable lipids such as LDL cholesterol and triglycerides and increase blood levels of desirable lipids such as HDL cholesterol. Several classes of medications are available in the United States, including HMG-CoA reductase inhibitors (statins), nicotinic acid, fibric acid derivatives, and medications that decrease intestinal cholesterol absorption (bile acid sequestrants and cholesterol absorption inhibitors). Some of these medications are primarily useful in lowering LDL cholesterol, others in lowering triglycerides, and some in elevating HDL cholesterol. Medications also can be combined to more aggressively lower LDL, as well as lower LDL and increase HDL at the same time. Newer medications, alirocumab (Praluent) and evolocumab (Repatha) have been approved to help lower LDL levels in certain pateints where diet and other statin medications have not worked adequately. Note: Dosing guidelines change. The U.S. Food and Drug Administration (FDA) issued a guideline concerning the potential dangers of taking the 80 mg dose of simvastatin (Zocor). nicotinic acid (niacin); Niaspan, Niacor Nicotinic acid inhibits the production of VLDL and consequently its metabolite LDL and raises HDL levels. In general, nicotinic acid (niacin) should not be used in combination with statins, because it leads to an increase in side effects (flushing, itching, nausea, and others) without improving outcomes. Many physicians would only prescribe nicotinic acid to individuals at extremely high cardiovascular risk who are unable to take other lipid-lowering therapy. PCSK9 inhibitors alirocumab (Praluent), evolocumab (Repatha) Indicated in patients where medication and diet have not worked to adequately lower LDL levels in patients with heart attack, stroke, or familial hypercholesterolemia. The reduction of LDL cholesterol is only part of the battle against atherosclerosis. Individuals who have normal or only mildly elevated LDL cholesterol levels can still develop atherosclerosis and heart attacks even in the absence of other risk factors such as cigarette smoking, high blood pressure, and diabetes. Lowering LDL cholesterol is currently one of the primary public health initiatives preventing atherosclerosis and heart attacks. The same measures that decrease narrowing in coronary arteries also may benefit the large arteries in the neck and brain (carotid and cerebral arteries) as well as the femoral arteries that supply blood to the legs and the arteries that supply blood to the intestine. Triglyceride is a fatty substance that is composed of three fatty acids. 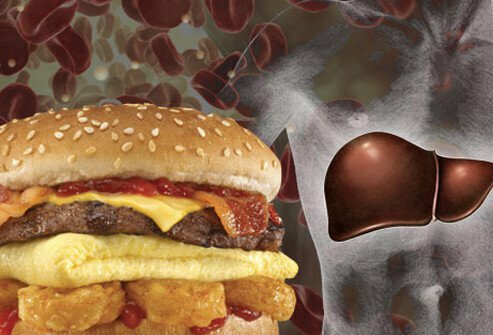 Like cholesterol, triglyceride in the blood comes either from the diet or the liver. In addition, like cholesterol, triglyceride cannot dissolve and circulate in the blood without combining with a lipoprotein. The liver removes triglyceride from the blood and it synthesizes and packages triglyceride into VLDL (very low-density lipoprotein) particles and releases them back into the blood circulation. High triglyceride blood levels (hypertriglyceridemia) may be genetic or they may be acquired. Examples of inherited hypertriglyceridemia disorders include mixed hypertriglyceridemia, familial hypertriglyceridemia, and familial dysbetalipoproteinemia. Hypertriglyceridemia can often be caused by nongenetic factors such as obesity, excessive alcohol intake, diabetes mellitus, kidney disease, and estrogen-containing medications such as birth control pills. Whether elevated triglyceride levels in the blood lead to atherosclerosis and heart attacks is controversial. While abnormally high triglyceride levels may be a risk factor for atherosclerosis, it is difficult to conclusively prove that elevated triglyceride by itself can cause atherosclerosis. Elevated triglyceride levels are often associated with other conditions that increase the risk of atherosclerosis including obesity; low levels of HDL cholesterol; insulin resistance; poorly-controlled diabetes; and small, dense LDL cholesterol particles. Diet is the first step in treating hypertriglyceridemia. A low-fat diet, regular aerobic exercise, loss of excess weight, reduction of alcohol consumption, and stopping cigarette smoking may be enough to control triglyceride levels in the blood. In patients with diabetes, meticulous control of elevated blood glucose is also important. This can be monitored by measuring the hemoblobin A1c levels in the blood. When medications are necessary, fibrates (such as gemfibrozil [Lopid]), nicotinic acid, and statin medications can be used. Lopid not only decreases triglyceride levels but also increases HDL cholesterol levels and LDL cholesterol particle size. Nicotinic acid lowers triglyceride levels and increases HDL cholesterol levels and the size of LDL cholesterol particles. Statins are effective for decreasing triglyceride and LDL cholesterol levels and, to a lesser extent, elevating HDL cholesterol levels. Stone, N. J., et al. "2013 ACC/AHA Guideline on the Treatment of Blood Cholesterol to Reduce Atherosclerotic Cardiovascular Risk in Adults: A Report of the American College of Cardiology/American Heart Association Task Force on Practice Guidelines." Journal of the American College of Cardiology 7 Nov. 2013. What kinds of treatments have been effective for your cholesterol? In what ways have you tried lowering your LDL cholesterol? What medications have you taken to lower your cholesterol or triglycerides? What side effects have you experienced? Please share your experience with high cholesterol levels.